Second Born is a sci-fi/fantasy mix adventure novel that starts with vicious mercenaries hunting Princess Sasha. Dragon-riders are then dispatched by the King and Queen to rescue her. This event underpins growing disaffection between Sasha’s parents (the King and Queen) and the dragon-riders, who the reader will learn much of in the course of the novel. I was quite taken with the descriptions of planets, dragon lore, and especially the character background scenes. The writing style was unique, and not overly descriptive. I enjoyed reading about the characters so much that it didn’t bother me that the main plot only started to develop at about 50% through. Thereafter, the peril made the characters yet more distinctive and I became completely absorbed with dragon-riders Jet, Vik, Damyil, and their culture. Sasha, Kaa’ln, and Larsom had complementary perspectives that added much. The author was adept at weaving interaction and situations with her characters to construct sub-plots that kept me happily reading. The inclusion of spaceships and planets, not dragons, initially made me want to read Second Born. There were a few notable sci-fi ideas as I continued to read: mirrors that acted as instant messaging systems, and a system of identity numbers. More could have been made of the sci-fi and technology, but perhaps not without detracting from the storyline and the rich world of dragons. The major criticisms I have of Second Born are the sheer number of spelling and grammar mistakes, incomplete sentences, and wrong words used. I had to distance myself from the incorrect text, which did affect how immersed I was in it. I had to read through obstructing webs to decipher the author’s message. As a result, these issues need to be resolved. I might have rated Second Born even more highly if the main plot didn’t break off as often into minor sub-plots before returning; sometimes it seemed to have been forgotten about. Also, it would have been nice if the dragons had a more active role than as telepathic reassuring presences, for the dragons lounged about a lot. 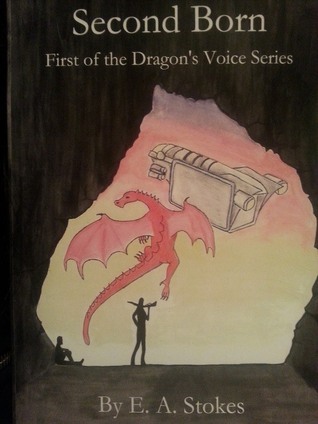 Second Born had a profound writing style, author voice, and plotline. EA Stokes is certainly an author I would consider reading again. She has proved she can conjure worlds and characters with ease, and make it a thoroughly enjoyable experience at the same time. Alex James is a freelance editor, proofreader, author and book reviewer who has a passion for science-fiction and fantasy! As an Author, he creates alienated protagonists that must be empowered; a theme present in all of his stories. In later works he has incorporated the idea of deception: ‘Nothing is as it seems!’ His writing inspirations are Asperger Syndrome, Star Wars, R Scott Bakker, Isaac Asimov, and Frank Herbert’s Dune. Having self-published several novels, he is also proficient with Book and Ebook Formatting for Kindle/Smashwords/Createspace. As a Book Reviewer, he has reviewed over fifty stories by indie and published authors, and has read over one-hundred and fifty. His favourite genres are science-fiction and fantasy: military, space-opera, heroic, and sword-and-sorcery. As a qualified Editor and Proofreader, he works on fiction and non-fiction for individuals, companies, and organisations and is always looking for new projects.